Posted March 28th, 2012 by Lisa & filed under flourless chocolate cake, Gluten-Free Goodness, IACP, lemon, pecan, S'mores, Urbantag. 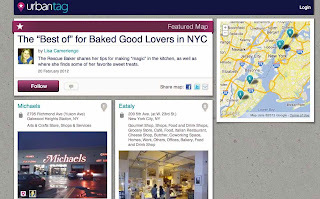 It wasn’t too long ago that Urbantag, a new website that makes it easy to share lists of your favorite local places with friends and followers, approached TRB to create a “map” of my favorite places for sweets. I accepted the assignment, believing I was doing a public service, because — despite the old cliche´ — you can never really have too much of a good thing. Thus, “The Best of For Baked Goods Lovers” was created. If there’s another map you’d like me to contribute, let me know. I’m always happy to oblige my fellow dessert-lovers. Oh, and before I forget, if any of you are planning to be in New York City on Sunday, April 1, please stop by the International Association of Culinary Professionals 2012 Annual Conference in Soho. TRB will be representing Staten Island in the “Taste of the 5 Boros” exhibit (exciting!!) and will have plenty of samples on hand, including Campfire Cookies, Mini Flourless Chocolate Cakes, Boozy Chocolate Caramel Pecan Bars and Lemon Poundcake. You definitely don’t want to miss it!